Peel the potatoes, cut into halves horizontally, wash and keep aside. In a cooker add freshly washed pieces of mutton and 1/2 tsp salt. 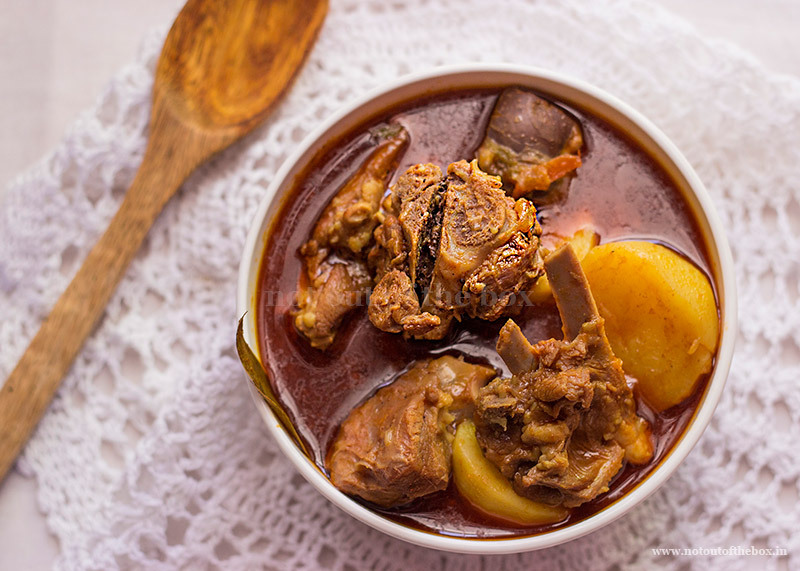 Adjust water to level the mutton in the pressure cooker. Close the cooker lid and take off the flame after 4 whistles. Open the lid after the pressure has reduced. Keep the stock, don’t drain. Fry the potatoes, let them turn golden brown in colour, remove and keep aside. Heat oil in a deep frying pan/kadai. Temper with dry red chilli and bay leaf. Add sugar, just gently stir the sugar until all of it has caramelized into a delicious looking golden brown color. Add onion paste and sauté until light brown in color, now add the garlic paste and sauté for a few seconds more. Add crushed black peppercorn, cumin powder, coriander powder, turmeric powder, kashmiri mirch powder, green chillies, salt and ginger paste. Mix and fry it on medium heat until the masala starts leaving oil. Add the mutton pieces and potatoes. Mix well with the masala and fry on medium heat for 10-15 minutes. Cover>Uncover>Stir. Continue with this process. Now add some mutton stock in this (one ladleful at a time), mix and fry for 4-5 minutes. Then add some more stock (the same amount). Repeat this process for 3-4 times. Cook on medium heat. Finally add rest of the stock, mix, cover and cook on a low flame until the meat is fully cooked. Stir in between to prevent from burning or sticking to the bottom of the pan. Add garam masala powder, mix and remove from the heat. IT MUST BE GOOD IN TASTE–IF I TRY THIS WITH OUT POTATO –WILL THIS GIVE US A DIFFERENT TASTE—PLEASE SHEAR,,? –IF I TRY THIS WITH OUT POTATO –WILL THIS GIVE US A DIFFERENT TASTE—PLEASE SHEAR,,? BECAUSE POTATO IS GIVING SWEETENED TASTE. 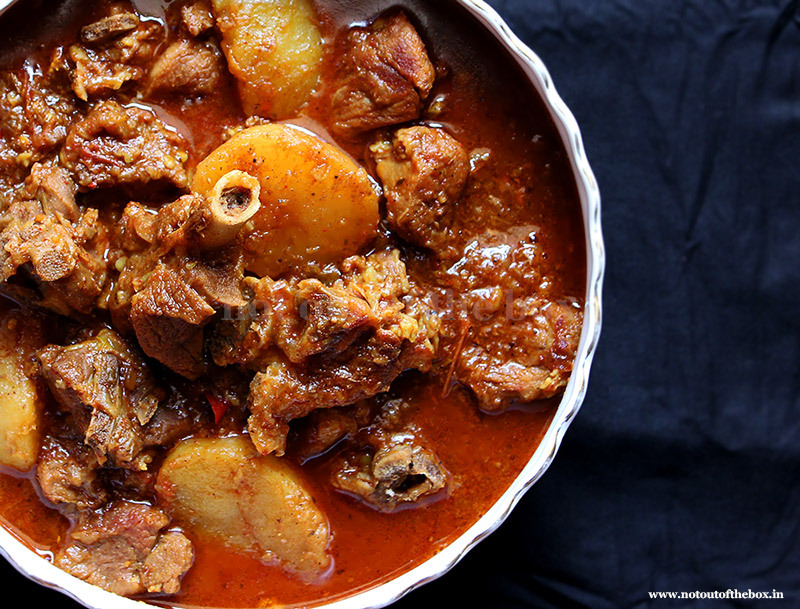 ALTHOUGH BENGALI PEOPLE LOVE MUTTON WITH POTATO…. A very tedious way of cooking, this is definitely not practical for regular weekend mangsho bhaat. Must be tasting good but much simpler recipes taste equally good.